Liquid lipsticks have been all the rage in the recent years, with every brand releasing their own type. Whenever I fall in love with a lip product, I end up getting a wide range of colors from the range (i.e. my obsession with Wet N’ Wild Megalast lipsticks). When I first tried out BauHau5 from the Kat Von D's Everlasting Liquid Lipstick range, I fell in love! I end up purchasing a few more and then received a couple of minis free with my order from KatVonDBeauty.com. …and let me tell you that these are so my favorite! I've been on a gotta catch em' all kinda obsession lately. 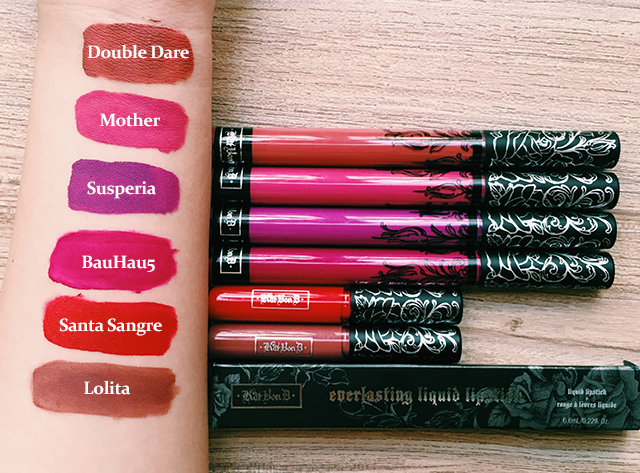 Each Kat Von D Everlasting Liquid Lipstick comes in a slim, black box. The body of the box has a rose design while the word “EVERLASTING LIQUID LIPSTICK” is printed in silver foil letters and stamped on the box. The name and colour of the lipstick shade are printed on a sticker-like material and pasted at the end of the box. The formula for all of these are consistent throughout, usually some darker colors tend to look patchy but all of these have a beautiful consistency. The texture is liquidy and not at all moussey, and they dry very matte but without any cracks on the lips. They feel so lightweight on the lips and they will fade after eating anything oily, otherwise these stay put for hours! I love wearing Double Dare to the office and it stays on comfortably past lunch. The only one that I have to layer on is BauHau5, even in the swatch you can see some patchiness but it's not at all prominent on the lips. Overall these are some of my go-to liquid lipsticks when I don't want to fuss with a bold lip color. I ended up getting the mini's as a gift with purchase when I ordered from the website directly. The full size are $20 each but the minis will last you a while!